every year, christmas is a big deal in our household, especially the last few now that we have gotten married. in our first year of living together, we went and picked a tree off the lot and since then we have cut one down. bee always had fake trees as a kid so now that she can a real one, we take full advantage of it. this year, broken rib and all, bee and i made the trek out yesterday to pine valley farms. it’s off of 70 and 97 in skyesville for those of you reading this that are in maryland. our first time out, we used one of the saws that the farm will let you borrow for $20 (you get the money back when you return the saw). we quickly found out that although tradition is great, bringing the sawz all that i got the next christmas to cut down the tree was the best idea we stumbled upon. as you might now, bee is a go getter and one time when she cutting down the tree, a fellow tree cutter downer brought over his sawz all for us to use. made quick great work of the tree. here is bee on the hunt for the best douglas fir on the the tree farm. last year, our eyes were bigger than our living room so we knew we had to go for something that wasn’t as wide this year, much to her dismay. we looked for something in the 7-8 foot range. once we found the right tree after walking several aisles, we got down to business. a great tip for those that might be new to christmas tree cutting down, bring an old blanket or sheet that you might use around the house for painting, etc. it makes a great location for you to lay on and get under the tree as you cut it down. keeps the mud, grass, and pine needles off of you. those of of you that are clean freaks like we are, it’s a great tip. don’t forget to wear old clothes too. it’s not a fashion show out there! 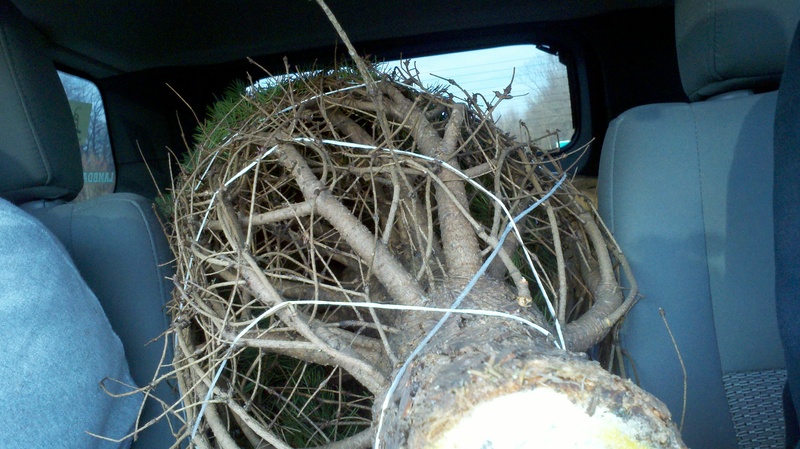 once bee made short work of cutting it down, it was over to shaking, bundling, and back to the car. unfortunately, the bundling got screwed up so we had to re-tie the string so it would stay bundled. we made the decision, after bee carried the tree back to the car, to put it inside instead of on roof because of my limited mobility to get the tree over my head and secured properly on top of the car. that is our new tree skirt that we splurged on at the end of the season last year. one of our friends had the similar tree skirt and we really liked it so we ended up getting ours and bee is very excited about it. we were using a traditional skirt that looked like the regular red stockings with white trim, but we wanted to get a little fancier going forward! so now the tree is up, the house is decorated and the stockings were hung (with care) by the fireplace. feels like christmas, although it was around 60 degrees today!